This is a call to gather to share insights on where we are in this season of change. Just returning from attending a powerful MorningStar Prophetic Round Table held in New York, I am confident that God is revealing specifically where we are in His timetable with the wisdom that empowers His people to strategically take steps to move forward into the new season. You will find this Round Table insightful, empowering and life-changing. 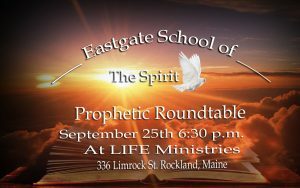 This Round Table also sets the stage for Eastgate’s “Fellowship of the Spirit” that begins Tuesdays October 2nd at 6:30 PM. The Fellowship of the Spirit is a journey we take together “as one” that will take us deeper into the life of the Spirit. As well as sharing testimonies, providing encouragement, prophecy and praying one for another, our quest is to hear the heartbeat of heaven. Our passion is to be filled with the fullness of the love and life of Christ. The call for every believer is to rise and shine with the manifest radiant light of His glory that impacts every aspect of life with the Kingdom of heaven (Is. 60:1-3). Now unto Him who is able to do exceedingly, abundantly, and beyond all, that we ask or think, according to the power that works in us, Unto Him be glory in the Church by Christ Jesus – Ephesians 3:20-21.